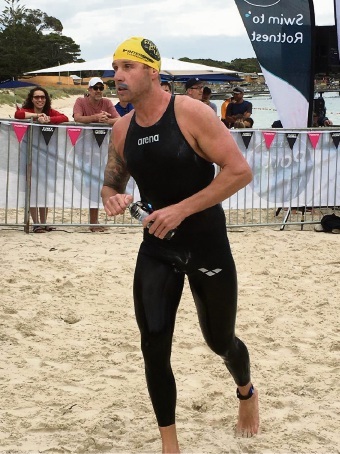 DEFENDING Port to Pub open water swimming champion Bradley Smith, of Alkimos, faces a big challenge to retain his title in a battle with dual Olympian Jarrod Poort on Saturday. Poort (22) is Australia’s best open water swimmer and represented Australia in the 2012 and 2016 Olympic Games. He became a cult hero in Rio de Janeiro after he took an unusually aggressive approach to the 10km swim, blazing ahead of the field for 9km, but tiring in the final stages. Smith doesn’t have Olympic cult hero status, but could become a local cult hero should he defeat the international swimmer. He won the inaugural 25km race from Leighton Beach to Rottnest in a time of 5hr 34min 33sec last year. Olympian Jarrod Poort will contend the Port to Pub. The event will also feature Mindarie’s Smoothy family, made up of dad Martin and his three children Sam (19), Esther (18) and Luke (14). Event organiser Ceinwen Roberts said it was exciting for local swimmers to have the opportunity to compete against elite athletes such as Poort in the longest swim in Australia. Poort expected the ultra marathon to pose a significant mental and physical test. “I imagine it will be a big achievement to say you’ve swam the Port to Pub, and I can see the swim growing into something very competitive in the years to come,” he said.